The outer part of the upper leaf has a brass nocturnal with folding sights, decorated and engraved with the initials 'W' and 'D'. It is decorated with a flower and arabesques and has the inscription 'VRSA MAYOR'. The nocturnal is combined with a universal equinoctial dial (gnomon missing) with hour lines numbered from 3 to 12 to 9, and the equinoctial line inscribed 'CIRCVLVS AEQVINOCTIALIS'. A concentric calendar scale is divided to 5 and to one day, inscribed with the abbreviated name of the month and the last day numbered. A corresponding zodiac scale is engraved more towards the centre of the leaf with the names of the zodiacal signs, but the reading is partly covered by the nocturnal. On the borders of the leaf is a shadow square from 45 to  to 45 on each side of the leaf, numbered from 40 to  to 40 by ten. The spandrels are decorated with foliate scrolls. 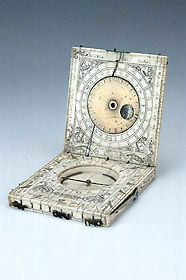 The inner part of the upper leaf has a pierced lunar volvelle and aspectarium, and is inscribed 'ELEVATIO POLI GRADI' and 'CIRCVLVS AEQVINOCTIALIS'. On the right is an unequal scale of latitudes from [0?] to 80? by 2?. Arabesques and foliages are in the corners and at the bottom is the date '15 86'. The inner part of the lower leaf has a horizontal string gnomon dial probably for latitude 52?, a compass (glass missing) and on the borders of the leaf, a compass rose with 32 directions marked. The string gnomon dial has common hours numbered from 4 to 12 to 8. Below the dial is a foliate scroll motif. The outer part of the lower leaf has a table of latitudes for 18 towns and the inscription 'ELEVATI POLI GRADI 52' in a foliate frame. On the edges of the dial is a compartment for stowing the pin and a brass arm for fixing the latitude, and foliate decoration. See P. Gouk, The Ivory Sundials of Nuremberg 1500-1700 (Cambridge, 1988) and S. A. Lloyd, Ivory Diptych Sundials 1570-1750 (London, 1992).